Shrager’s book, “Age in Place: A Guide to Modifying, Organizing, and Decluttering Mom and Dad’s Home,” is a comprehensive guide designed to help make seniors’ homes safer and easier to navigate. It takes the reader through an aging person’s dwelling room-by-room, identifying potential risks and offering solutions. An occupational therapist for the last 37 years, Shrager has worked extensively with seniors in their homes. She understands what a challenging experience the aging process can be, especially for caregivers of independent loved ones. Many seniors don’t want to leave their homes, she said, while others cannot afford to. For their caregivers, figuring out how best to house them can be overwhelming. Shrager makes it clear that staying in the home is possible, but families need to recognize and address potential safety issues sooner rather than later. Aging comes with numerous challenges, not just for the individual, but also for their caregivers. In addition offering room-by-room advice, this guide simplifies decisions for families. 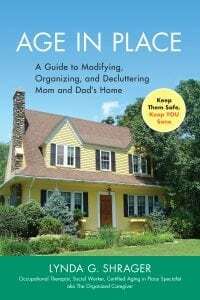 “Age in Place: A Guide to Modifying, Organizing, and Decluttering Mom and Dad’s Home” is Lynda Shrager’s second book. 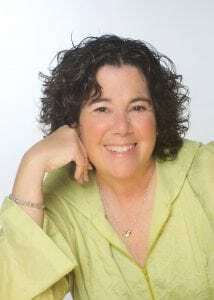 She is also the author of “Otherwise Healthy – A Planner to Focus Your Thoughts on Organizing Life after Being Diagnosed with Breast Cancer.” Her newspaper column, “Mom’s Rx,” appeared in numerous newspapers across the country, including the Times Union. Shrager is also a featured columnist for Everyday Health, a leading online consumer health web site.